We have launched a new award to celebrate employers who encourage everyday walking in the workplace. We want companies of all sizes and in every sector to sign up for the Walk at Work Award – a new accreditation which will recognise employers that are promoting walking and physical activity, and offer guidance to those who want their workforce to become more active. Active meetings, lunchtime walks, standing desks and promoting ways to get to work on foot will all count towards the award. With the average working-age adult sitting down for around 9.5 hours a day, we are aiming to reverse the trend of inactive workplaces and celebrate employers that are getting their staff moving. By signing up for the award, employers will receive one-toone support on how to create a walking culture at work as well as examples of best practice and where to find extra help and resources. 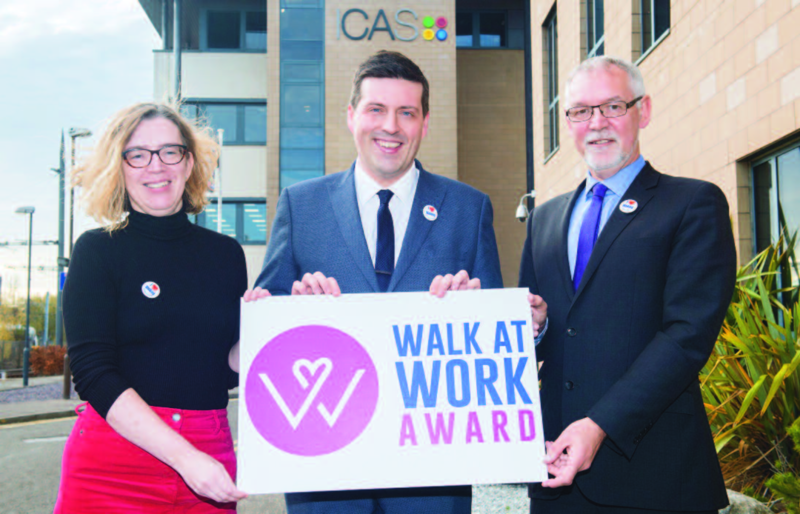 The Walk at Work award was launched in Edinburgh by the Minister for Business, Fair Work and Skills, Jamie Hepburn, in November 2018 when the Institute of Chartered Accountants in Scotland (ICAS) signed up to take part. Ian Findlay, Chief Officer at Paths for All said: “Walking is one of the simplest and best things we can do for our physical and mental health. It’s free, you don’t need special equipment and it can be easily incorporated into the average working day. "Research shows that employees who are physically active in and around the working day take fewer sick days, are more motivated and productive, and are more able to concentrate, so walking is not just good for us, it’s good for business. "Many adults sit for long periods of time while at work, so workplaces must take action to reduce sedentary behaviour and improve health and wellbeing. "This award will not only reward workplaces that are creating a walking culture for their staff, it will also increase and encourage a variety of different walking opportunities and activities during the day. "Working alongside partners such as Cycling Scotland, who offer the Cycle Friendly Employer Award, and having received endorsement from Healthy Working Lives, this new award is part of a suite of awards available to help create a healthier, more active workforce." said: “When people commute, particularly those who work in offices or who travel by car, they tend to be more inactive. “This award will reward employers who encourage regular walks, breaks from the desk and activity during the working day. It will also offer support to businesses who are interested in helping their staff become more active but perhaps don’t know where to start. As regular participants in the Step Count Challenge – our biannual workplace online challenge – ICAS in Edinburgh were keen to sign up to the Walk at Work Award. Step Count Challenge to sharing pedometers and staying active through the day with the option of standing desks. Recent findings from UK workplaces reveal that half of all employees experience poor mental health at work, including stress, anxiety and depression. Regular walking can reduce the effects of poor mental health, particularly walking in greenspace.